A PDF version of this article appears in the October 28, 2016 issue of Executive Intelligence Review and is re-published here with permission. All you have to do is to take my laws, which I presented. Those laws, my laws, define exactly what solves the problem by creating a standard by which credit is defined. This was developed by the Treasurer of the United States [Alexander Hamilton]. This is the only way it will work. . .
All you have to do is go for an international program based on that principle, the same principle, and you’ve got to get the people of the nations working together to understand what this kind of action is. Just read the publications on law by [Hamilton]. He wrote the laws. They’re written there. But people don’t do it. They talk about something else. Therefore, they don’t understand what makes history, what makes history work. What I did was actually a mechanism to define the way in which the original system had been established. By Hamilton. You don’t have to do anything else. That’s what you have to do. . .
You’re talking about Hamilton’s laws, and you’re talking about my laws. That’s what you’re talking about. Don’t change the subject. . .
You have to get an international agreement among nations, among a significant number of nations, which will create a credit system, an international credit system or something tantamount to that, which will deal with this problem. We’re not talking about that, yet. You have to talk about that; you’ve got to talk about the work of Hamilton. You’ve got to put the name of Hamilton in there, and you’ve got to put my name in there. Because that’s the only way you’re going to get that thing done. Get some books about Hamilton’s economy. It’s all there. All I did was to put this thing into standards which conform to what Hamilton laid out. People have to take the handbooks, the records of Hamilton; read those things as Hamilton stipulates. Use that. Do it! Then you can go to the table and say, “Now we can create a credit system.” Take Hamilton, and take what I have done. Put the two things together, and that work contains enough information to define exactly what has to be done. It’s just ignored because people want to be stupid. Let us be as clear as possible on the most crucial point. What is being discussed here, what Mr. LaRouche is proposing, is not “economic theory.” It is an Action Plan, a solution to the current trans-Atlantic financial and banking crisis. It will work, but it will work only if the precise method prescribed by Mr. LaRouche is followed. It is, in fact, the only way out of our current crisis. Between January of 1790 and December of 1791, that is, over a period of a mere twenty-four months, Alexander Hamilton authored five documents which created the sovereign United States of America and brought into existence a national Public Credit System, entirely new in the history of the human species. • December 5, 1791—the Report on Manufactures. Much more will be said about these documents later in this article, but for now only a few observations need be made. George Washington was inaugurated as the first President of the United States on April 30, 1789. At that time, the new government, as established by the recently ratified U.S. Constitution, was not even functioning. The nation was de facto bankrupt, its currency debased and its finances in a state of chaos. This was the crisis that Alexander Hamilton, as the new Secretary of Treasury, was tasked to solve. Hamilton’s measures and his actions were entirely successful. What is more, however, is that Hamilton did not simply implement means to solve a “financial crisis”; he brought into existence—created—a system of Public Credit whereby a sweeping future-oriented transformation of both the nation’s physical economy as well as the culture of the nation might be accomplished. If the reader of this article will take the time to read the full document published by Lyndon LaRouche in 2014, and then proceed to read and study the reports issued by Alexander Hamilton in 1790 and 1791, the full coherence of what LaRouche and Hamilton are proposing will become very clear, particularly as to matters of principle. It is strongly recommended to read the five documents authored by Hamilton that are listed at the beginning of this report in chronological order. The benefit in doing so is to experience how Hamilton proceeds step-by-step in the creation of his system. True, some of what he discusses is specific to the time and circumstances within which he lived—such as in his discussion of gold and silver coins in the Report on the Mint—but that is the point. Hamilton is not writing timeless academic economic theory. He is dealing with a crisis, and he is defining the way, the only lawful and effective way, to overcome that crisis. To truly understand what Hamilton is doing, one must look out through his eyes. In many of his writings from 1790 through 1794, Hamilton is very explicit that Jefferson and his allies are intent on overturning the 1788 Constitution. Everything they did was directed toward that end. Thus, Hamilton’s banking and economic writings of 1790-1792 are not ivory tower speculations. They are written under war-time conditions. In early 1791, Thomas Jefferson released his Opinion on the Constitutionality of a National Bank. This was not a mere critique of Hamilton’s proposal for a National Bank. It was the opening salvo of all out war to defeat Hamilton, destroy the Washington Administration and overturn the Constitution that had been ratified only two years earlier. Jefferson’s declaration of war against Hamilton would unleash what became an open rebellion against the Washington Administration, including an armed insurrection against the U.S. Government—known euphemistically as the “Whiskey Rebellion”—and widespread anti-Washington and anti-Hamilton riots in 1794-1795. This would culminate in the assassination of Hamilton in 1804. It is sometimes stated by illiterate historians that, “Hamilton was for manufacturing, and Jefferson was for agriculture.” What a lie! Hamilton was for human progress, human advancement, science and industry; Jefferson was for slavery and enforced human backwardness. It is also useful to note that the greatest enemy of Hamilton’s demand for scientific and manufacturing progress are the proposals put forth by the British Empire’s Adam Smith in his Wealth of Nations. Everything Smith proposes, on behalf of his British masters, is contrary to the approach which Hamilton initiated. Every step of the way, beginning with the proposal of Madison’s pro-slavery anti-national “Virginia Plan” at the Constitutional Convention in 1788, through Hamilton’s proposal for the National Government to assume the debt of the individual states and unify the finances of the nation, through his defense of “government corporations,” and into his proposal for “bounties” in the Report on Manufactures, Hamilton was at war with those who favored sectionalism, slavery, a weak national government and unchecked financial speculation. His adversaries included the British Empire, the southern slavocracy and the corrupt swindlers of what later became known as Wall Street—the friends of Aaron Burr. It was under these—the most adverse — conditions that Hamilton set about, beginning in 1790, to erect his new system. As one makes one’s way through Hamilton’s five documents, the effect is of entering into the mind of a great architect, as Hamilton sets out to create the nation. Each tier creates the basis for the next tier, with the vision of the completed edifice always in mind from the start. The end intention determines all of the preliminary and subsequent steps. He begins at the beginning. The nation is bankrupt. In the Report on Public Credit he provides the evidence of this bankruptcy, he defines the moral and legal issues at stake, and he defines the solution as one of securing a well- funded and secure public debt, one which will meet all obligations. He articulates a detailed plan of tariffs, taxation and other measures to ensure that all bona fide debt obligations will be met and confidence in the nation’s credit restored. He states that this is the pre-condition for a desired revival of trade and promotion of agriculture and manufacturing. During the Revolution, the Continental Congress had borrowed heavily from the French government and from Dutch bankers, but the government, from a lack of revenue, had stopped paying both principal and interest on those debts in 1786. By 1789, the nation’s foreign debt totaled $12 million dollars, and its domestic debt—a combination of state debt, bills of credit, and various notes and certificates—stood at $65 million. Even worse, the new government lacked the funds to operate day-to-day. Between September and December of 1789, Hamilton secured loans, totaling $170,000, from the Bank of New York and the Bank of North America,1 to cover the salaries of the President, the Vice-President, Congress and other necessary functions. Then, in January of 1790, he issued his Report on Public Credit. Hamilton’s aim, in this Report, is threefold. The first is to stop the hemorrhaging, to prevent the nation from descending into financial and economic chaos. The second is to unify the finances of the nation, to eradicate all sectional and local authority over matters of public credit. The third goal, one which Hamilton will proceed to address more directly in the Second Report on Public Credit (the Report on a National Bank), is to create the basis for an expanding system of public credit generation, for the purpose of developing the physical economic potentials of the nation. Hamilton is ironclad in his demand that all government debts—state, local, national and foreign—will be paid at full value. The details of his proposal are multifaceted and comprehensive, and it is not possible to fully elaborate on them here. He proposes a series of very detailed steps, all of which are designed to provide confidence in the nation’s credit, as well as to generate low-interest capital for investment in the nation’s economy. It is in this Report that Hamilton also establishes the basic principle that the nation’s public debt, if properly funded, will provide the basis for the generation of new credit that will stimulate investment and economic development. A key component of Hamilton’s plan—one fiercely opposed by Jefferson, Madison and Monroe—was for the National government to assume the millions of dollars in individual state debts. This would have the effect of transforming all of the state debt holders into national debt holders, solidifying the position and sovereignty of the National government. This was accomplished with the United States Funding Act of 1790, through which $21 million of state debt was taken over by the National government. Under this act, the states were given extremely generous terms, and the shedding of their debt burden left the states with substantial revenue, earned through the federal securities, enabling them to directly invest in industry and promote economic enterprises. In his Report on a National Bank, Hamilton next proceeds to the issue of Sovereign credit generation as the essential life-spring for the new republic. There is no substitute for reading this report, and a mere commentary does it an injustice. Suffice it to say that Hamilton makes short shrift of all the objections to the Bank, defines the principles upon which it will operate, and then he proceeds to enunciate a twenty-four point detailed plan for the actual day-to-day operations of the bank. 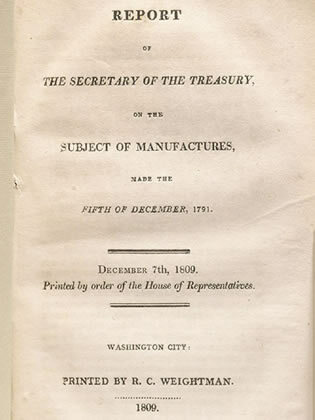 It is toward the end of the Report that Hamilton first introduces his proposal to use the funded debt of the nation—a funded debt which he, himself, had established with the First Report on Public Credit and the Funding Act of 1790—as the means to provide new credit for manufacturing, agriculture, trade and other useful enterprises, thus establishing a National Public Credit System. Under Hamilton’s proposal, a percentage of the sovereign debt of the United States (up to $2 million) will be deposited as assets in the new Bank. These funds will then allow the Bank to issue notes, as loans, for the financing of many useful enterprises. The notes could also be deposited with other financial institutions as well as circulate among businesses, establishing a sound financial market and integrating the entire financial system of the nation into a nationally directed Public Credit System. Security of the notes would be guaranteed, since their issuance was based entirely on the sovereign debt obligations of the National government. It should be noted, that in both the First and Second Reports on Public Credit, Hamilton spends a good deal of time on the need to create a system which will generate large amounts of low-interest credit for investment in manufacturing, agriculture and other useful enterprises. The immediate effect of Hamilton’s plan was to create a legal, sound banking system, under continuous national review, with the intention for providing for the rapid physical-economic development of the nation. Hamilton is keenly aware of the power of banking and the power of credit to foster economic development. At the same time, as proven by his later writings and actions, Hamilton is explicit that all illegal, unsound and shady financial practices will be choked off through the deployment of the National Bank as the regulator of the nation’s credit system. Hamilton’s third Report, the Report on the Establishment of a Mint, is of too technical of a nature to elaborate here, but it should not be passed over without comment. In these first three Reports, Hamilton moves from securing the credit of the nation, to national banking, and then to the currency itself. There is a progression, a lawful creation of a national system of banking and credit. Hamilton is extraordinarily precise as he moves, step-by-step, in erecting his system. Nothing is arbitrary. All of the actions are of one design. Then, in December of 1791 came the Report on Manufactures. It is here that the completed nature of Hamilton’s Public Credit system comes to light. This Report contains the famous “Section VIII: The Encouragement of New Inventions and Discoveries,” where Hamilton defines the Constitutional responsibility of the government to transform the nation—as a matter of permanent ongoing willful policy—to promote the scientific and industrial development of the nation. Hamilton is very explicit as to the genuine power and mission of the National government to promote these changes. There are many passages in the Report which make all of this very clear, but rather than cite lengthy quotations here, it were better left to the reader to obtain a copy of the Report and investigate the matter for one’s self. Hamilton also proposes the creation of a “national manufactory,” i.e., not simply the financing of individual factories, but the creation of a centralized hub where the most advanced forms of technology and industry might be developed. Simultaneous with the writing of this Report, Hamilton initiated the founding of the Society for Establishing Useful Manufactures, as an attempt to put this proposal into motion, and he led the effort to establish a pilot project at Paterson, New Jersey through a combination of private investment and loans from the National Bank. All you have to do is to take my laws, which I presented. Those laws, my laws, define exactly what solves the problem by creating a standard by which credit is defined. This was developed by the Treasurer of the United States [Alexander Hamilton]. This is the only way it will work. . . Just read the publications on law by Hamilton. He wrote the laws. LaRouche’s use of the term “laws,” as opposed to “policy” or “program,” or some other similar term, may seem odd or eccentric to the lazy reader, but it is not LaRouche who originates this concept of lawfulness; it is precisely the approach insisted upon by Hamilton, himself. This is nowhere more clear than in his Opinion as to the Constitutionality of the Bank of the United States. There are, in fact, two parallel and intertwined concepts of lawfulness to consider here. One is Hamilton’s insistence that not only are all of his measures lawful, but that the contrary proposals of Jefferson, et al., are unlawful because they are contrary to the species-nature of the Republic that was created at the Constitutional Convention in 1788. The very nature of the sovereign Republic which came into existence in 1789 demands the Public Credit System that Hamilton defines in his Reports. The contrary proposals put forth by Jefferson and Madison are more in tune with what would later emerge as the Confederate States of America in 1861. The second thing to recognize is that Hamilton’s policies are lawful simply because they work. And they represent the only approach that will work. They worked then, and Lyndon LaRouche’s redefining of Hamilton’s Laws will work today. One thing that leaps off the page in reading his Reports is that Hamilton continually makes the point, not only of the necessity for his initiatives, but of the Constitutional legality of everything he is proposing. For the perceptive reader, what becomes clear is that Hamilton is not proposing individual pieces of legislation, nor simply particular banking measures—he is defining the actual Constitutional Nature of the Republic. His argument is that legality is to be found in the actual dynamic intent of the Constitution itself. It is very instructive to witness Hamilton’s lawful—as Einstein would understand the term lawful—and relentless pursuit of his goal. No arbitrary actions are allowed. No tyrannical actions. Every action, beginning with the assumption of Revolutionary War and State debts, through to the proposals within the Report on Manufactures, follows a lawful progression. It is a mandatory path that must be followed. Following the release of Hamilton’s Report on a National Bank, that document came under violent attack from Thomas Jefferson, James Madison and other apologists for the southern slavocracy. The focus of these attacks was their denial of the right of the National Government to establish, by law, corporations, since there was no specific “enumerated” right named in the Constitution granting the government that specific right. Hamilton’s argument, one earlier enunciated by Gouverneur Morris, is that the General Welfare Clause, within the body of the U.S. Constitution, provides all of the legal backing required for the government to take any lawful action—not arbitrary, but lawful—in pursuit of the intentions of that Constitution, as adopted at Philadelphia in 1788. Every power vested in a government is in its nature sovereign, and includes, by force of the term, a right to employ all the means requisite and fairly applicable to the attainment of the ends of such power, and which are not precluded by restrictions and exceptions specified in the Constitution, or not immoral, or not contrary to the essential ends of political society. 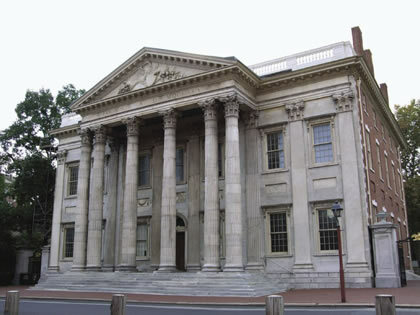 First Bank of the United States (1797-1811), 120 South Third Street, Philadelphia, Pennsylvania. [All property rights] which are contrary to the social order, and to the permanent welfare of society ought to be abolished. . . Whenever, indeed, a right of property is infringed for the general good, if the nature of the case admits of compensation, it ought to be made; but if compensation be impracticable, that impracticability ought not to be an obstacle to a clearly essential reform. This does not imply that the government may do anything it chooses, as in the call by Jefferson and others to repudiate Revolutionary War debt. It means that the sovereign power of the National government can and must be employed on behalf of the intent of the Constitution, which, itself, is coherent with Natural Law. Within that intent, as Hamilton defines in his Opinion as to the Constitutionality of the Bank of the United States, the power of the National government is awesome. As LaRouche states, “My laws, define exactly what solves the problem by creating a standard by which credit is defined.” To reiterate, in the briefest sketch-synopsis, those Laws are: Glass-Steagall, National Banking, a Federal Credit system to generate high-productivity trends in improvements of employment, and a Fusion-Driver and space “Crash Program.” This is the Hamiltonian solution to today’s crisis. It worked in 1790-1792. It will work today. The axiomatic flaw of almost all modern financiers and economists is that they do not assign a true “human value” to any financial investment. Their system is valueless and mathematical. Thus, misguided fools would define the problem we face today as “How to fix the banking system.” That approach can lead into all kinds of hare-brained schemes, many of which would leave intact the oligarchical system of usury and speculation. That is not Hamilton’s approach. That is not LaRouche’s approach. 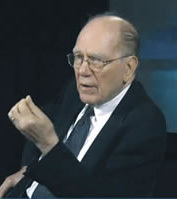 Consider the question of reimposing Glass-Steagall and so-called “banking reform.” As Lyndon LaRouche has forcefully insisted, Glass-Steagall is a vital necessary step, a precondition, for a return to both sound—Constitutional—banking practices, as well as a genuine economic recovery. But it is not “banking reform” legislation! It represents a Constitutional Principle, one indispensable for the future development of the population. On the other hand, defining Glass-Steagall as synonymous with a simple “banking reform” is sophistry. Yes, under Glass-Steagall, we will separate out the viable elements of the commercial banking system. We will regulate them, reform them, and integrate them into a viable National Credit System, much as President Franklin Roosevelt did in 1933. We will then create a system of National Banking and Public Credit, as Hamilton did. Hamilton’s rigorous approach, in his Reports, of identifying legitimate debt, sound banking, Constitutional credit generation, and scientific and industrial progress has stood the test of time. It is future orientated. What is being built? What is being created? What is being transformed? This must be the necessary orientation. The purpose of the use of a Federal Credit-system, is to generate high-productivity trends in improvements of employment, with the accompanying intention, to increase the physical-economic productivity, and the standard of living of persons and households of the United States. Today, tens of millions of Americans are standing at a precipice, overlooking an abyss, as living standards, health care, education, and the nation’s culture vanish. Heroin and other drugs are everywhere. These same Americans know that the worst is still to come. Hopelessness and fear are spreading throughout American society. The nation of China, on the other hand, has elevated 800 million of her people out of poverty during just the last 20 to 30 years, and is now leading the world in science, space exploration and economic development. This destruction of the population in the trans-Atlantic world must be reversed. The entire population must be uplifted, in terms of its standard of living, its access to “high productivity” employment, but also in its access to classical education and its exposure to those creative inputs in science and in the arts which will provoke creative investigations and breakthroughs within the individual human mind. It comes in the ability of mankind, to develop within the human individual the characteristics to give a higher degree of power to mankind as a whole, through self-development of the human species. That’s the only thing that is important . . . The issue is, can the human species produce from within its own ranks a body of people who will meet the challenge of defeating the kind of evil we have to face now . . .
Mankind is not a bunch of objects that you can manipulate and make the toys dance for you. That does not work. You actually have to create a power in mankind which is improved over previously existing expressions of mankind. That is the whole game. And you have to spread this kind of development, such that it sustains itself. 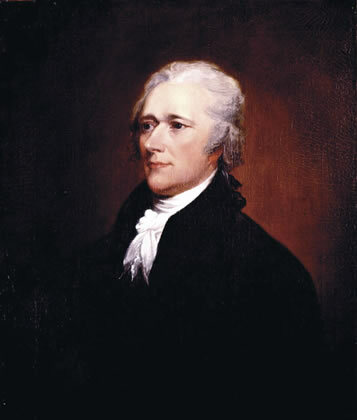 Hamilton’s creation of a system of Constitutional Public Credit solved the financial/economic crisis of his day, but it is also important to recognize that in so doing, he defined the advancement of the population—that is, the ongoing cognitive development of the population—as the axiomatic law of the new Republic. This is explicit in both the Opinion as to the Constitutionality of the Bank of the United States and the Report on Manufactures. The uplifting of the population, the enhancement of their potentials, in a permanent, ongoing way, is the true Hamiltonian nature of the American Republic. It is, in fact, the Law of the Republic, and anything opposed to that is illegal and unconstitutional. That is what must be done. Any other approach is un-lawful and un-Constitutional. Hamilton defined the Laws by which the economy and the banking system must function. Lyndon LaRouche’s Twenty-First Century redefinition of Hamilton’s approach, in his Four Laws, shows the way into the future. 1. The Bank of New York was founded by Hamilton, and the Bank of North America was founded by Hamilton’s ally Robert Morris. Think Like an American — Restore Hamilton's Bank!